Adamus Phillida spent years looking for the Brotherhood; assure him they've always been "right behind him." Receive the contract and the arrow for the assassination. (Optional) Take his finger and place it in the desk. Return to Ocheeva to collect your reward. The mini-quest to get your next contract from Ocheeva is named "The Assassin's Gambit". She tells you that you must kill Adamus Phillida, a recently retired Imperial Legion officer, who has taken up residence in the City Watch barracks in Leyawiin. For this task, you have been given an enchanted arrow called the Rose of Sithis. The Rose of Sithis is specially commissioned and crafted to kill one person--in this case, Adamus Phillida. When fired on anyone else, it only wounds them. If you can hit Phillida with the arrow when he is not wearing his armor, the strike will be fatal. Head to Leyawiin, stalk Adamus Phillida, and attack when the moment is right. The contract will be complete when Phillida is dead, whether you use the Rose of Sithis or not. When Adamus Phillida is dead, you can return to the Sanctuary for your reward. If you want to receive your bonus, however, there is one more task you must complete. Phillida wears an Imperial Legion ring. Take his finger, with the ring still attached, and put it in the desk of Phillida's Imperial Legion successor, in his office in the Imperial City. After you receive the quest from Ocheeva, travel to Leyawiin and head to the small pond. Every day at around 3-8pm, Adamus, accompanied by his bodyguard, will unequip his armor and take a swim in the pond. Wait for him to go into the water, then go into sneak mode and make sure you are not detected. Find a good spot, and shoot the Rose of Sithis at a part of his body that is sticking out of the water. You can also kill him using the Rose of Sithis while he's sleeping in the barracks, as he is unarmored then, as well. He will die instantly (even though it only counts as assault) and you can return to the sanctuary for your reward. It is very hard to avoid incurring a bounty from this kill, as there is a glitch that will get you 40 bounty even if you shoot him with the Rose undetected. You must kill him in one hit by any means to avoid a bounty. If you really want a challenge, one possible approach is to walk up to Adamus Phillida and inform him to his face what you're there for. This will result in every single guard in the city attempting to kill you. If this doesn't end with your death, it will probably end in a massive bounty. You should not do this unless you're high level and a member of the Thieves Guild. Now, loot the finger from his body (along with a bunch of keys to various places) and head for Imperial City. Now enter the Prison District of the Imperial City, and wait for nightfall; just before 3am. There should be no guards in the office. Go into Sneak mode, and enter the Imperial Legion Offices (remember all the keys?). As previously mentioned, there shouldn't be any guards around so late at night, so head to the desk right by the entrance and pick the lock. Place the finger in the desk (by clicking on the desk and, within the inventory window, clicking on the finger; unlike some other quests, the quest item does not automatically get transferred for you). The chest to the left of the desk is known to have good treasures in it, it would be a good idea to loot it while you are there. Head outside undetected, then head to the sanctuary for your reward and bonus. The reward for this quest is the standard 50-600 gold (level-dependent) reward given for each Dark Brotherhood quest. The bonus is an additional 500 gold. Be sure to use the key from Adamus's body on the Commanders Chest to the left of the desk, it contains a level dependent amount of gold and some random armor. After you complete this quest, a special edition of the Black Horse Courier is published: Adamus Phillida Slain!. "This was my big break! Finally I'm given something important to do, and what happens? I blow it! All I had to do was keep Phillida alive! That's it! But no! I couldn't even accomplish that! Father was right -- I'm an idiot, and I haven't amounted to anything! I let everyone down, so this is it. Goodbye cruel Empire! I'm ending it all!" It seems this quest originally had a different plot, or at least, extra elements to the existing plot. An NPC named Gwendolyn and two Imperial Legion Centurions (with ID names "Ceremony", suggesting a funeral for Adamus Phillida) are defined in the Construction Set with ids that start with "Dark09", suggesting they were intended to play roles in this quest. None of them exist in the game, however. If you used the Rose to kill Phillida, it's possible to find it in his corpse. Taking it has no consequences, and it can still be used as a regular arrow. It is very hard to avoid incurring a bounty from this kill, as you will get 40 bounty even if you shoot him with the Rose undetected. You must kill him in 1 hit by any means to avoid a bounty, this can occasionally change to a bounty of 1040 after the message proclaiming Adamus' death. 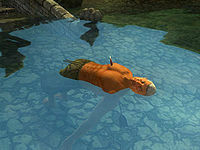 Sometimes the Rose of Sithis does not kill Adamus, even while he is swimming and wearing no armor. This is caused by him reacting to the hit and equipping his armor before the arrow's script runs, which then "sees" that he is armored and treats it as a mistimed shot. This is a very rare event, so reloading and trying again is usually the best option, though pickpocketing his shield may also resolve the issue. It is possible for Mazoga the Orc to be killed if she comes to your aid while you are being chased by the town guards. To prevent this from happening, complete the quest Mazoga the Orc beforehand, or be sure not to flee in the direction of Leyawiin Castle. ? If you break back into the Imperial Legion Offices, you can take Adamus's finger back out of the desk, and when you exit the desk, you will get a message saying that you have completed the quest, even though it has been previously finished. It will not raise your number of quests completed, and will only move the Permanent Retirement quest log under "Completed Quests" to the top, not duplicate it. Like any other Town Guard, Adamus' bodyguard will eventually respawn, so if you wait too long after completing this quest all you will find is a distraught (and living) bodyguard who will never leave the barracks. When you take Adamus's severed ring finger, no fingers are lost on either of his hands. When Phillida dies, his bodyguard will become hostile to you if he actually sees you. It does not matter how Phillida dies. Even if you reverse pickpocket a poisoned apple on him and wait some place else, far away from Phillida, then, after the quest confirmation message appears stating that Phillida is dead, if you approach his bodyguard at this point, he will turn on you. Since you do not have any bounty on your head, many NPCs will side with you, but all guards will help Phillida's bodyguard and attack you. This bug is fixed by version 3.4.3 of the Unofficial Oblivion Patch. This can be fixed by casting an area Charm spell on the bodyguard and any other city guards helping him and then yielding to them. Since you do not have a bounty on your head, all guards including the bodyguard will immediately turn peaceful and walk away. 10 I must kill Adamus Phillida, a recently retired Imperial Legion officer, who has taken up residence in the City Watch barracks in Leyawiin. For this task, I have been given an enchanted arrow called the Rose of Sithis. If I can hit Phillida with the arrow when he is not wearing his armor, the strike will be fatal. I should head to Leyawiin, stalk Adamus Phillida, and attack when the moment is right. The contract will be complete when Phillida lies dead, whether I use the Rose of Sithis or not. 20 Adamus Phillida is dead. I may return now to the Sanctuary for my reward. If I want to receive a bonus, however, there is one more task I must complete. Phillida wears an Imperial Legion ring. I should take his finger, with the ring still attached, and put it in the desk of Phillida's Imperial Legion successor, in his office in the Imperial City. 30 I have acquired the severed finger of Adamus Phillida, with the ring still attached. I should now go to the Imperial City, and place the finger in the desk of Phillida's Imperial Legion successor, in his office in the Prison Barracks. If I do this, I will receive a bonus. Or, I may forfeit the bonus and simply return to Ocheeva at the Sanctuary. 40 I have placed the finger of Adamus Phillida in the desk of his successor, in his office in the Imperial City. I should now return to Ocheeva and claim my reward, and bonus. 100 Finishes quest I have returned to Ocheeva at the Sanctuary. It is possible to use the console to advance through the quest by entering setstage Dark09Retirement stage, where stage is the number of the stage you wish to complete. It is not possible to un-complete (i.e. go back) quest stages. See SetStage for more information. Esta página foi modificada pela última vez à(s) 14h26min de 9 de junho de 2015.